today I am not posting any DT projects just a little card I made to please myself and to enter into the current challenge running over at Get Funky! The challenge is called 'Let's get Sentimental' and I had this little guy in mind as soon as I saw the Funky Freebie paper. As a dog lover, I couldn't resist this image when it came through the door on some advertising gumph, so I made him into a topper for a card. There are some stripes in the image and they marry up nicely with the free papers and the colours work too in a sort of Jubilee theme ...Red White and Blue.. Well I think so. Look at that face. 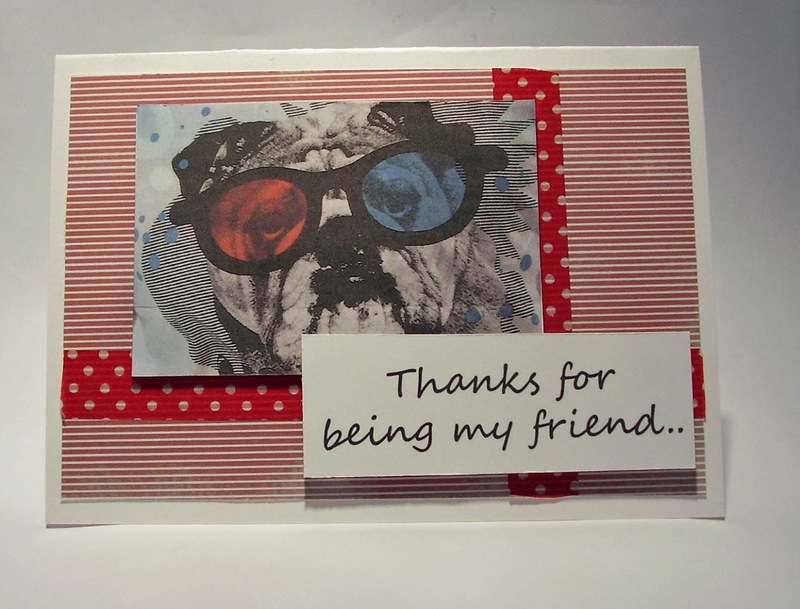 This doggie needed no frills to send his message, just a some embelishments of red polka-dot washi tape and the sentiment, also as part of the April free paper. This little moppet is going to a good home.and I think he's cute. I hope you like him too. Thanks for stopping by to check out the blog. Don't forget to leave your comments, I love hearing from you. He is so lovely! Great card and love the use of images that fall through your front door. Thanks for joining in with the Get Funky Challenge this month. 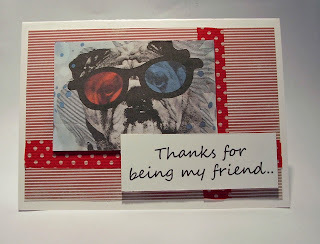 Fab card - greatr image and the freebie paper looks great. Thanks for playing along with us at Get Funky this time. oh that bulldog is awesome!! and you used the freebie great!! thank you for getting funky with us this month!